It’s Tuesday again! This means today we are going to meet my new guest! Come in! Come in! Make yourself at home! Thank you for accepting my invitation and being the first man of the new season visiting my coffeece. I hope you will enjoy the chat and the coffee, of course. As per usual, I am going to ask you six sets plus a Bonus Qs section of questions covering your personal profile rather than the professional one. Today, you are going to answer the first three sets, then on Thursday the remainder of them. Are you ready? I am, so… let me take my papers, and… let’s start! ▷ Lloyd William Joseph Bingham. I quite like having two middle names as it’s quite rare amongst native English speakers and makes me sound rather noble! William runs in the family, but my parents added Joseph for some reason. ▷ When people ask what I do, I don’t say I’m a translator, I tell them I run a translation business. Not only does this give due credit to the business side of the job, but I find it invites more curiosity and allows me to better explain everything my work entails. ▷ I can’t remember the last time I measured myself and I don’t have a tape measure handy, so I can only describe myself quite unhelpfully as ‘average height’. I do recall Lucy Brooks of eCPD Webinars, when we met for the first time, remarking I was taller than she had imagined. ▷ Gemini, although I’m not a believer in astrology. Plus it has the unfortunate association with a band of the same name that holds the title of the worst-scoring UK entry to the Eurovision Song Contest. ▷ Cardiff – the city I was born and grew up in. But I studied in Newcastle and have lived in Toulouse, Munich, Alicante and Northumberland (in rural north-east England). I’ve loved everywhere I’ve lived but I’m glad to be back in Cardiff. Like many of the other great industrial cities like Manchester and Birmingham, it has changed a lot (for the better) in the last fifteen or so years and feels truly European whilst retaining its native Welsh charm. Plus there’s a large community of freelance translators here. ▷ It used to be silver and I had my bedroom painted that colour as a teenager. Then it was like a royal blue for a while. Now it’s a sleek, professional black when complemented by other colours, as reflected in my brand identity. ▷ Commercial pilot! I loved flying and even joined the Air Cadets, but my love for language had too firm a grip on me for this dream to be realised. And it doesn’t help that I don’t like heights. ▷ Coffee comes first but I do like tea as well. I rarely drink typical English tea (builder’s tea). Call me weird but I like drinking different tea depending on the season, for example Chai in the autumn (the spices go well with darker evenings), Lapsang Souchong in the winter (lovely smoky flavour of burning wood), Earl Grey in the spring and Lady Grey (like Earl Grey but with orange) in the summer as it’s a lot lighter. No milk in my tea! ▷ Both. Each has its own unique ambiance. ▷ Generally the sea. Splashing about in rough waves with the salt air getting up your nose makes you feel truly alive. But then again so does skiing down a snow-covered mountain. ▷ I love a good lie-in, but then feel bad about wasting half the day. ▷ Curry! Love it. My other half doesn’t east spicy food though, so it’s a rare treat. ▷ Not particularly. In the past I’ve cooked a good paella though. ▷ Sporty. I do alright. I play badminton twice a week and have been known to go running and swimming. I tend to go to the gym for a certain period of time, then pack it in, and start back up months later. ▷ The most recent one I read was Watching the English by Kate Fox. It’s about 10 years old but still entirely relevant and illustrates how bizarre (in a good way) the English are. For example, not only do they like a good queue, there are also invisible queues at the pub. Also, which way up you hold a fork is an indicator of class apparently. ▷ I wouldn’t, but my fiancée would. Languages are considered geeky, in the English-speaking world at least, but I don’t do anything else nerdy. I do regular blokey stuff too like go to the pub and play on the Playstation. I don’t like football though, if that counts against me. ▷ PC. Nothing against Macs, though. Except they’re overpriced. ▷ That said, iOS. I’ve had an iPhone for over four years and never want to go back to Android. ▷ Twitter. Facebook is on the decline now, I reckon. Too much trolling and too many huge fallouts over nothing. I find Twitter much better for forging professional links. ▷ My guilty pleasure is Grand Theft Auto. Follow me and Lloyd on social media to read the latest news! Who’s Lloyd? 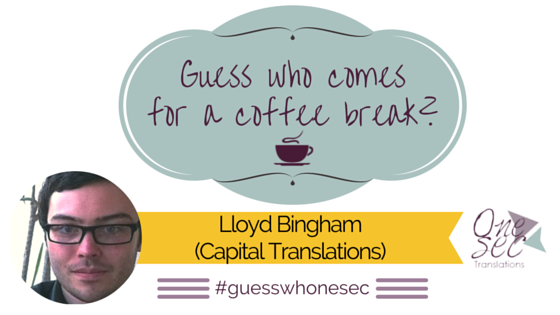 ▷ Lloyd Bingham runs Capital Translations in Cardiff, UK, working from French, German, Spanish and Dutch into English. A former in-house translator, he specialises in marketing and business. Lloyd is unhealthily passionate about encouraging translators to become more immersed in their industry and delivers presentations on how they can use Twitter to engage with their colleagues. Recently, he has campaigned for maintaining professional standards in translators’ behaviour online and turning the tide against client and colleague bashing in order to find solutions to the issues in our profession instead. Lloyd is a qualified member of the Institute of Translation and Interpreting (ITI). Follow him on Twitter and on Facebook. So wonderful to get to know Lloyd better! Although we did have the chance to meet in person, we didn’t have enough time for a proper chat. Another person to join the club of translators who like the colour ‘black’ 🙂 Though I must say ‘silver’ was a surprise – I can’t really imagine a bedroom painted silver (pics or it didn’t happen). That was long ago, Alina. In retrospect, it was hideous. But as a teenage boy, it was super cool! :))) I don’t doubt for a minute the hideousness of it (sorry, Lloyd), but I’d love to see a pic if you have one.